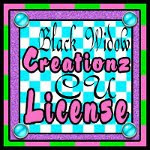 For this you will want to get the PTU tagger scrap kit called My Flower Garden by Crystal's Creations HERE. You will want the tube called Helen of Troy by Jason Lan which is sold at Artistically Inclined Licensing HERE. You need to have a license to use this art and have it displayed in your creation. I use Gimp 2.8 which is a free program (see left sidebar for link to download Gimp) but any version will work, and you can easily configure this to your program of choice. Paper 2- scale to 650x200. R click ALPHA TO SELECTION, SELECT>SHRINK by 9. Hit DELETE on keyboard. Move this layer to top. Add drop shadows to the layers that have asterisks (*) with settings at 1/1/1. 4. I am using a font called Vaguely Fatal in white then just adding a drop shadow with prior settings. Hope you enjoyed this tutorial, thanks for looking!